Chalet Himalaya is run by enthusiastic skiers Mark Gardiner and his French wife Cathy, who designs the menu using seasonal vegetables and organic fresh local produce. 'Himalaya' has been beautifully restored in the traditional Savoyard luxury with a huge open fire, outdoor Jacuzzi, sauna and a welcoming atmosphere that offers excellent cuisine and fine French bottled wines. Self-catered rentals available outside of the winter months from May to November. Experience that counts: Leave your cooking worries behind, our professional chalet staff prepare freshly baked cakes for afternoon tea and serve a sumptuous 4-course evening meal beautifully complimented with quality bottled French wines and a delicious local cheese board. The Go-Alpine owners Mark and Cathy Gardiner, have been in the ski business collectively for over 20 years and leave nothing to chance to ensure that you will have a fun and totally stress-free holiday. 'We give you the value for money you deserve, which is why 65% of our guests come back and ski with us again.' Remember to book early for the peak periods as our chalets do get booked up very quickly. We look forward to hearing from you soon. Loads to see & do: Local activities include skiing, snowboarding, olympic bob-sleigh run, ice climbing, paragliding, cross country skiing, husky dog driving, horse drawn sleigh rides & snowshoe trekking. Why not ski 7 different resorts in one week. We are ideally placed to make it a reality and REALLY give you something to tell your friends when you get home. Heliskiing available by reservation. Lift Passes and local services: Lift pass pre-booking service available. Discounted equipment hire with up to 40% and the 7th day FREE. All lift passes, ski school & equipment etc can be reserved in the UK at the time of booking but should be paid for on arrival in resort to ensure you get the best price. Duvets and pillows provided Bed linen prices for self catered rentals 8.50€ per double bed 7€ per single bed. Service wash available by staff: 10€ per load. DVD player, MP3. Ski locker and heated boot room with professional boot dryer. Thank you all at Chalet Himalaya for looking after us so well during our week with you! The food was lovely, the wine more than drinkable, the facilities top... and we couldn't have wished for better skiing conditions! Extra thanks to Mark as well for really going out of his way to assist with Ski school etc., really took a massive load of us in terms of organising our trip! This is the fourth time staying at Chalet Himalaya, yet this time we booked the whole chalet. Everything was fantastic, the chalet hosts were brilliant and the food was gorgeous. There is nothing nicer than coming back from a hard day's skiing to freshly made cakes and a spell in the jacuzzi. The four course evening meals were delicious. We also thoroughly tested the wines! Mark and Cathy, as always, made us all feel very welcome and as Mark had organised our lift passes, we were able to get out on the piste an hour after we'd arrived. Everyone in our party loved the chalet, the jacuzzi and the skiing. When we stayed here previously, we went as a couple and the mix of guests has always been brilliant. We've always had a great time, loads of fun and I would highly recommend a visit, you'll definitely get looked after. We thoroughly endorse everything Jackie and Hugh (review Sept 2009) have already said. From the phone call to book, to the moment we left everthing was taken care of. This was our first chalet experience and it will be difficult for anywhere else to come up to the same standard.Excellent accommodation, facilities,food, wine & hosting. Mark very kindly allowed me to accompany him on the slopes so that I could feel comfortable taking my "less confident" wife skiing. Nothing was ever too much trouble. Mark & Cathy, you really have a beautiful home and together with Gavin & Monika, know the meaning of excellent customer service & attention to detail. We didn't want to leave and would love to come back again.Would certainly recommend. Het is een groot chalet zeer geschikt voor meerdere gezinnen of een grote groep. Once again a fantastic week had by all. Lovely warm welcome, excellent food and wine and even babysitting down a black run - what more could you want! Good location, not too far to walk to get to the lifts. The property is clean and very well maintained. Excellent customer service. I would definately reccommend this property to a friend or relative. Thanks for another great holiday. Hope to be back again next year? Go Alpine Himalaya Chalet Les Arcs. This was our fourth time skiing at Les Arcs and each time we have been accommodated at the excellent Go-Alpine Himalaya Chalet. It is run with military precision to the highest of standards by Mark and Cathy Gardiner, who are very friendly and always show a positive attitude towards their guests, with nothing ever being too much trouble. The Chalet itself set in the picturesque village of Peisey, only a five minute walk (including kids) to the nearest lift that takes you to the main ski area. The food and service is exceptional! With a hot or cold breakfast with juices, freshly baked cakes for afternoon tea and a four course meal in the evening that is all cooked to the highest of standards that you come to expect in a five star hotel! The accommodation itself is very clean and comfortable and all rooms have an en-suite shower room, along with plenty of storage space for clothes etc and with a hotub situated outside over looking La Plagne, you are exposed to maximum relaxation after a hard days skiing. We have thoroughly enjoyed our time over the last four years at this chalet and for as long as we ski at Les Arcs, we shall continue to choose Go-Alpine and the Himalaya chalet as our place to stay. At the heart of the huge and high Paradiski ski area boasting 425km of piste and simply unlimited off-piste opportunities. The chalet is 250m from the local lift giving you the choice to ski either La Plagne, Les Arcs or maybe even both in the same day. 2 1/2 hrs transfer from Geneva or Lyon, 1 1/2 hrs from Chambery and 20 minutes taxi ride from Landry/Bourg St. Maurice train station. 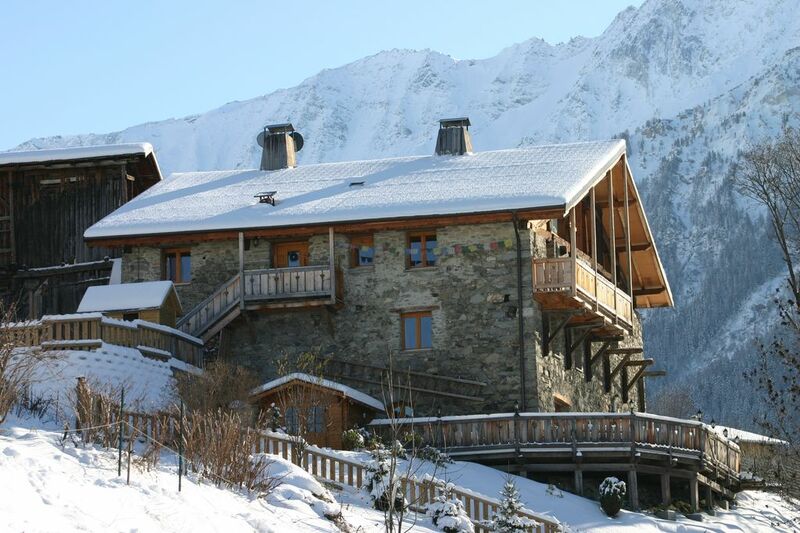 Ski: Peisey-Vallandry really is the place to stay to make the most of BOTH Les Arcs & La Plagne's 425km of piste. The 'Vanoise Express' 200 person cable car and the 6-seater 'Peisey-express' chairlift quickly places the whole Paradiski ski domain at your feet. Snowboarders are well catered for, as most lifts are chair lifts. No walking to the ski school, it is right there as you step off the lift. Ski Paradiski by day and return to the peaceful village of Peisey by night. 3 bars, 2 restaurants, an Intersport ski shop, a small supermarket, tourist office, patisserie, cheese shop, butchers , & post office provide all the essential resort amenities. Summer: Beautiful gateway to the Vanoise National park. Summer activities include, nature watching, walking, mountain biking, white water rafting, climbing, via-ferrata, tennis, climbing or simply relaxing in the pure mountain. Excellent 9 & 18 hole professional golf courses 6km from the chalet in Les Arcs. Fancy yourself as a Sir Bradley Wiggins come and cycle a stage of the Tour de France.